He’s gone from calling Donald J. Trump crazy and being one of his greatest critics to Trump’s biggest brown-noser who tirelessly fights for every wild conspiracy the President espouses. Wall Street Rebel has lost count of how many times Trump has managed to get Lyndsey Graham to do a backflip. President staunchest defender Sen. Lindsey Graham (R-S.C.) once again took a position on Thursday Donald Trump will not like. 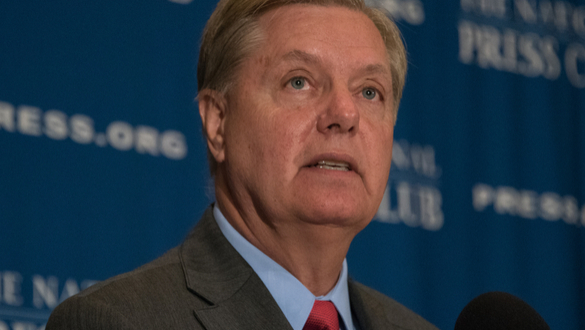 Graham took the position that he believes the American public should see Trump’s tax returns. This was the same position he took on this subject during the 2016 GOP primary. “Everybody” running for president in 2020 should publicly release their tax returns — including Trump, who is already campaigning for re-election. The reason is simple. The President could have criminal liability if his income taxes are made public. Sanders is ignoring the fact that that POTUS promised during his campaign that he would release his tax returns after he became president, then after he was elected Trump broke the promise saying he said that people didn’t care about seeing them. How long will it take Senator Graham to reverse his opinion? Does the President have something on the Senator? Does he have photos or evidence of the Senator’s long-rumored homosexuality? Could he win re-election if it was revealed he is a homosexual? The way Senator Graham has failed to defend his longtime deceased friend and American hero Senator John McCain has left many Democrats, Independents and Republicans baffled and wondering if he’s been blackmailed by his new best friend, President Trump.